We have assembled brief profiles of the milkweeds we are targeting for restoration. The milkweeds featured here are all herbaceous perennials (forbs). Many of these species have distinctive flowers and foliage. We have tried to capture these features in the texts. 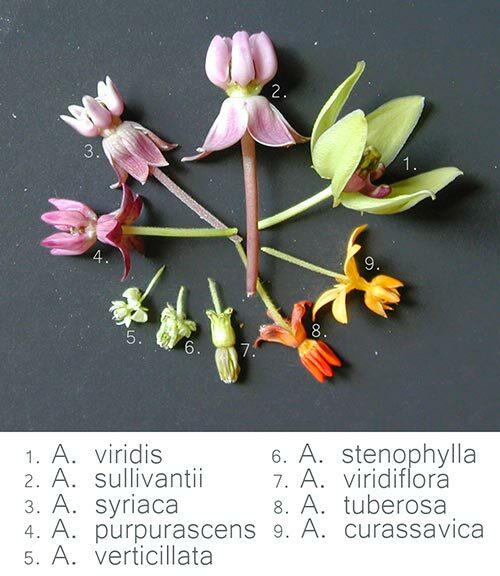 The flowers of all milkweeds share similarities (all have corollas with 5 petals, pollinia and stigmatic grooves, etc.) but differ in details. 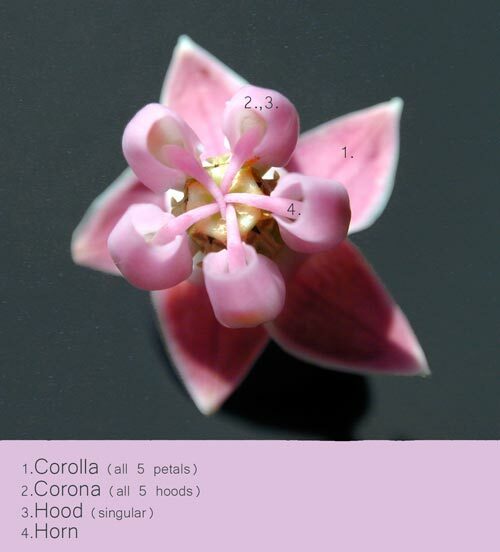 To describe these details, we have used conventional botanical terminology. 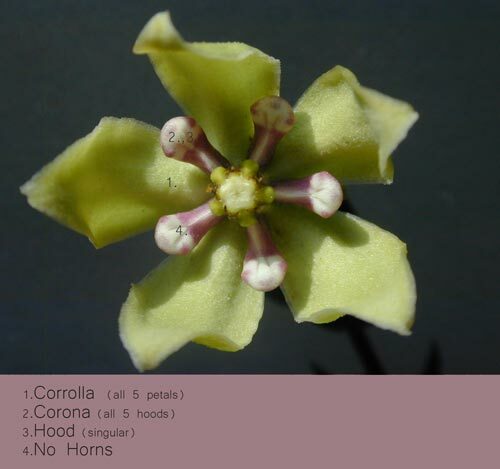 A short glossary has been provided as well as images with labels of typical milkweed flower parts (below). Milkweeds contain various amounts of cardenolides (cardiac glycosides) and in some species these compounds are potent enough to cause the death of cattle and horses if consumed in large quantities. Such events are rare. None of the species listed here are known to be highly toxic or a danger to humans and animals. Most grazing animals learn to avoid milkweeds and all but a few humans abstain from eating milkweeds due to the bitterness and toxicity of the leaves and pods. The information for these profiles has been assembled from a variety of sources (cited for each species), and we are dependent on them for accuracy. Not all of these species are well known and information on some features may not have been available in the sources we consulted. If our descriptions are inaccurate or otherwise found wanting, and you have the correct information, please contact us so that we can correct these pages. If you are involved in the restoration of any milkweed, you should consult the BONAP North American Plant Atlas to determine the counties in which each species naturally occurs. 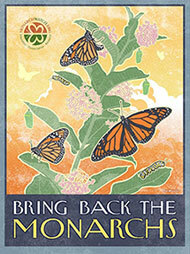 Our goal is to encourage the restoration of milkweeds in habitats and locations from which they are already known. Each profile is accompanied by images, many of which were provided by Bobby Gendron and Gary Stell. More images will be added to these pages as they become available. 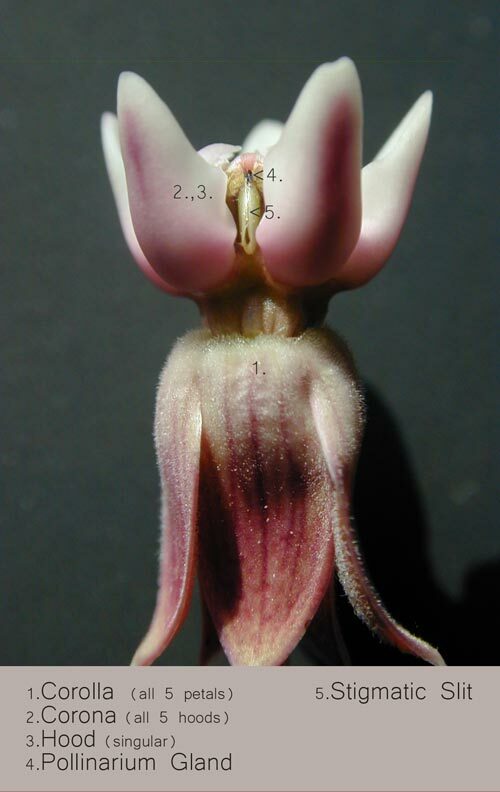 All files contain images of flowers but for most species we need images of the seed pods, leaves, and the entire plant. 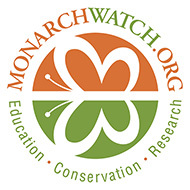 If you have such images, and would like to contribute them, please contact us at Monarch Watch. Milkweed flowers are both beautiful and structurally complex. 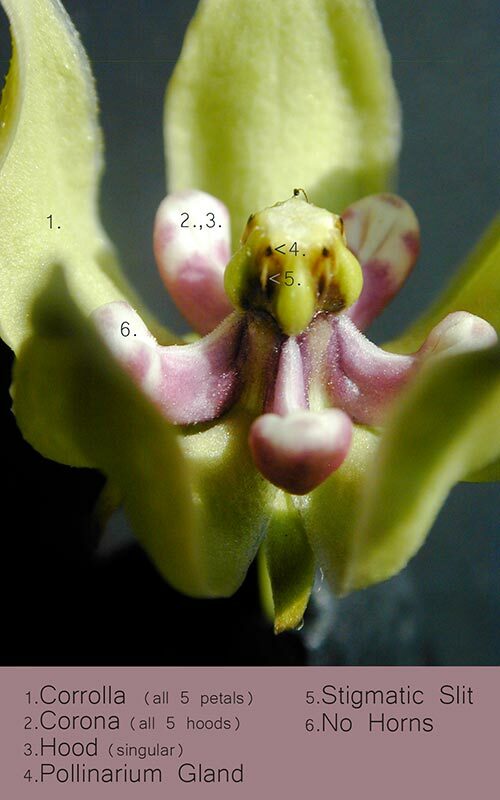 Botanists use the structural features of flowers to assess the similarities and differences among the species to aid them in classification. For our purposes these features can be used to help identify different milkweed species. A few glances at the images below as you learn about the milkweeds in your area will help you identify and appreciate this diverse and interesting group of plants that are so essential to the survival of the monarch migration.